Worth Noting – Baldwin's Custom Hat and Boot Co. Proud to see that a couple of my hats attended Longmire Days in Wyoming with the Actor Robert Taylor who plays Sheriff Longmire. Thanks, guys! Baldwin’s Custom Hat Co. won the Reader’s Choice of Best Western Hatmaker from True West Magazine for 2014. The honor is shared with Limpia Creek Hats of Fort Davis, Texas. Thank you for the recognition, True West readers! True West Magazine and their Best of Western Wear for 2014. 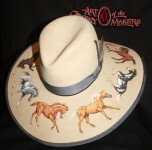 Baldwin was again honored at the Art of the Cowboy Makers event in Loveland, Colorado, June 6-9, 2012, with the People’s Choice Award with this hat entry. 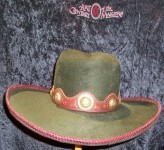 More about the Art of the Cowboy Makers on their website and facebook page.